With its diverse landscapes and untamed essence, Limpopo is a province that lends itself to adventures of the highest order. But with wonderfully wild experiences winking seductively almost everywhere you turn, knowing where to start could pose something of a challenge. It was cold, wet and misty when we pulled up into the deserted, frangipani-scented parking lot of the Magoebaskloof Canopy Tour. Dashing through red mud toward the offices, I wondered if this slow and steady soak meant cancellation of our booking. Turns out there are few things powerful enough to throw a spanner in the works of adventure in this part of the world. So, we got into our gear and set out slipping and sliding down the sludgy path to the first of the thirteen platforms, leading to the first of twelve zip lines, varying in length, speed and height. Taking you right into the heart of the Letaba River Gorge, Magoebaskloof Canopy Tour offers an elevated view of an otherwise untouched part of the world – all rushing waterfalls, tall indigenous trees and intriguing little life forms when you take a closer look at the rock faces, leaves and trunks while waiting for your next slide. The rain had been a blessing indeed, as the guides told us that just a week earlier the area had been bone dry, leaving the canopy tour’s iconic 20m waterfall a sad little trickle – even the healthy rush we were witness to on the day, apparently paled in comparison to the power it could reach in when things got properly wet. Well, one very good reason to keep going back! The tour lasts between two and three hours and groups are limited to between 1 and 8 people. Find out more on the Magoebaskloof Canopy Tour website. I’m sure we can all agree that there are few things more viscerally moving than a proper bushveld sunset. And when you get to experience it with an ice-cold drink in hand a-top a double-decker barge – all at once, everything is just right with the world. During a two-day stay at Shiluvari Lakeside Lodge in the Soutpansberg region of Limpopo we were treated to a sunset cruise just like this on the Albasini Dam with an added bonus: traditional delicacies for snacks – from mopani worms and roasted termites to fresh peanuts and samp. With local guide, Samson Mudlauzi at the steer, this cruise doubles up as an excellent birding opportunity, as he points out the diverse and intriguing water bird species that nest on the small islands dotted along the lake and hunt fish from its shores. Find out more on the Shiluvari Lakeside Lodge website. 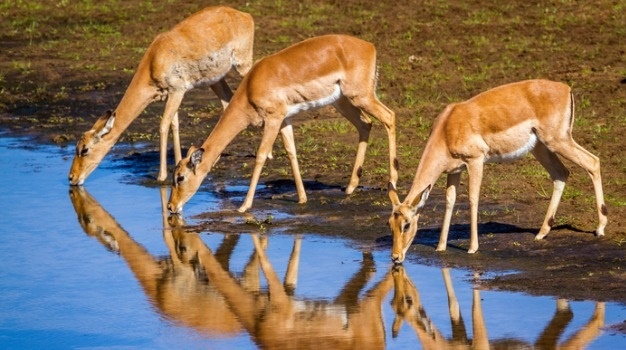 Located right on top of the Soutpansberg, Leshiba Nature Reserve is a family-run mountain retreat that offers guests the opportunity to get right up close to nature in a variety of amazing ways – from horseback safaris to trail-running and even just good old walking. During a guided game walk, one of the knowledgeable rangers will show you the ropes of animal tracking and tree identification, help you to recognise medicinal and useful plants and help you spot as many of the 250 bird species that have been recorded at the property as possible. Perhaps, however, it’s the geological trail that would leave you most in awe, as it takes you into the mystical history of the San tribes that used to call this mountain range home. Leshiba is home to no less than seven rock art sites, carrying both bushmen (San) paintings and Khoe Khoe hand and foot prints all ranging between 200 and 2000 years of age. During this guided geological walk, you will be able to get right up close to these ancient artworks and have a guide help you understand something of what they may be communicating. Find out more on the Leshiba Nature Reserve website. Apart from being a province of adventure, Limpopo is ultimately also a place of mysticism and magic. While some legends – like Modjadj, the rain queen – are well-known, others will only surface in conversations with locals. One of these is the sacred rock pool of Mashovhela, located in the Morning Star Nature Reserve. According to the tales passed down through many generations, there was once a powerful Venda king who could defeat all his enemies by beating a magic drum. For many decades, he reigned without opposition and grew in wealth and stature… until one night… he, along with his magic drum, vanished. It is believed that he disappeared into the Western Soutpansberg and slipped into the afterlife through a rock pool. Legend has it that his sacred drum beat can sometimes still be heard, echoing off the cliffs surrounding the Mashovhela rock pool. It is said to be the second most sacred site in Venda land, after Lake Funduzi. During a stay at Morning Sun Nature Reserve, you can go in search of the king and his magic drum on foot, as a hiking trail takes you right up to the sacred pond. While swimming is prohibited, it offers a tranquil spot for a picnic and an inspirational place to spin a few yarns of your own. Find out more on the Morning Sun Nature Reserve website.